This merciless machine might belong to Israeli militants preparing another Jewish colony– a common scenario on Palestinian lands. The watching silent family could be the indigenous peoples of Brazil’s disappearing forests. Or farmers of Gujarat, India, relocated by the Sardar Sarovar dam. Just as First Nations’ livelihoods and wildlife inhabitants of Canada’s boreal forests were invaded to make way for Alberta’s massive oil extraction operatio. That opening passage some will recognize from Grapes of Wrath, John Steinbeck’s 1939 novel — perhaps the most powerful portrayal of a people uprooted, forced into poverty– internally displaced refugees. It’s a process newly identified by Canadian researcher and author Naomi Klein as “disaster capitalism”. Klein brilliantly and poignantly defines the occurrence in her 2007 The Shock Doctrine: The Rise of Disaster Capitalism. Shock Doctrine describes in unequivocal terms how corporations and companies – I would include “non-profit” NGO institutions and human rights agencies among them–have learnt to respond with rapid-fire corporate re-engineering of societies still reeling from shock to profit from a multitude of disasters:– man-made catastrophes, wars, reckless economic policies, economic embargoes, climate-induced disasters, or other world changing crises. Grapes of Wrath is perhaps the earliest dramatization in English of what we now recognize as “disaster capitalism” (although none of that is indicated in summaries of the story.) The epic journey of Steinbeck’s Joad family began with a climate disaster—droughts that turned vast farmlands into what became know as the dust bowl, invoked in Wood Guthrie’s 1940 collection Dust Bowl Ballads. Some may recall, as I did, a passionate story of the Joad family, with the noble Tom Joad striving to keep hope alive; and Ma Joad, the optimistic matriarch directing her forlorn, dwindling family forward. What I remembered from the novel and the film are beautifully crafted characters with their personal hardships and disparate responses to misfortune. 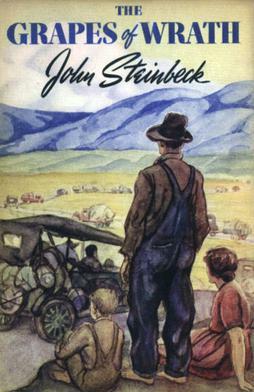 In the character of Tom Joad, artists have found inspiration: there was singer-songwriter Woody Guthrie, himself a dust bowl refugee from Oklahoma; two generations later, Steppenwolf Theatre Company produced a stage version of Grapes of Wrath; and in his 1995 album “The Ghost of Tom Joad”, Bruce Springsteen draws comparisons between the dust bowl and modern times. Today, immobilized by an accident, I’m rereading Grapes of Wrath after a 40 year hiatus. Now Steinbeck’s political message moves into the forefront. This is not the history of a climate refugee family. It is the history of capitalism in America—disaster capitalism-– with an alliance of police force and wealth, where machinery is supreme, where honest labor is not enough, and where the family is secondary–a worthy reread in modern American times.